There are days when I long to go back. Not back to the parts of my life that were painful, but the days where life was easy and innocent, days amongst the laughter of my sister and the teasing of my brother. Days like today, where the sun is hiding beneath a gray wintry bed of clouds, no birds in sight, no squirrels chasing through the grass, makes me feel subdued and a tad bit lonely … as though I’m longing for the sunny bright days of yesterday. On afternoons like this, I have the great blessing of working from home and so I set my work aside and pull out the old mixing bowls. Perhaps you have seen them or maybe you are fortunate to own your own Pyrex mixing bowls from the 1940’s. 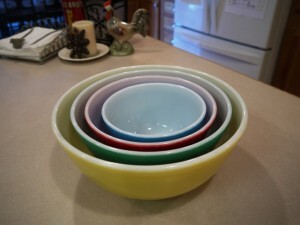 They are a nesting set made up of yellow, green, red and blue bowls. Just one quick look at them thrusts my mind right back to the days of childhood, when life was just a bit … well … simpler. As I pull the bowls from my cupboard, I am reminded of memories attached with each specific bowl. The large yellow bowl tapped into my memory and began to shake it a bit as to awaken the sleep from the corner’s of my mind’s eye. I remember Christmas eve when we’d have icy cold Christmas punch made up of grape juice and ginger-ale. Or the yellow bowl would make me think of cinnamon roll dough rising big and puffy out over the edges or cold winter evenings when Mom would pop popcorn and mix up popcorn balls that spill out over the yellow edges. The green bowl reminded me of mixing up ginger snaps with my sister. She was always creating some fabulous concoction and I specifically remember her making homemade brownies in the bowl, washing it out, and mixing up fudge frosting. The blue bowl held frosting. Fudge frosting, white creamy vanilla frosting, and sometimes brown sugar frosting. At times, it held leftovers or even a small amount of red cabbage salad made with fresh ingredients from Mom’s garden. But the red bowl, well, I have no memories of that one. You see, one of us broke that early on, so we never had a red bowl at my house. Only recently did I find out there was a red bowl. “WHAT! Of course. Buy them quick before someone else gets them!” I exclaimed. The day they arrived, I felt like a kid in a candy shop, or at Christmas when you finally got the bike you always wanted. I lovingly washed them and placed them on the bottom shelf of my upper cupboards so I would see them, even when I didn’t need to use them. The kitchen was always a happy place at Mom’s. It was a place where life happened, wounds were healed with the lick of a fudge covered spoon, hearts were mended with the spoon that held homemade caramel sauce, and words came easily over bites of hot rolls with melted butter oozing out onto our aprons. My mother made life happen in the kitchen. She was most at home there and made it a place of refuge. When other children were sad at our schools, or church group, we’d find ourselves inviting them over to bake brownies or make snicker doodles, while Mom poured big frothy glasses of milk and listened sympathetically. The bowls became a feeling of contentment and love. The green bowl represented cookies and the taste of warm sugar and spices. The yellow bowl became a representation of the happiness that you’d feel when biting into cinnamon and brown sugar and knowing that life was safe at your parents home. And the blue bowl … well that represented family get- togethers where salads or gravy was passed from person to person. Pulling the nesting bowls down from the cupboard meant today that something was making me uneasy. Something just wasn’t right. The day felt like it was closing in and winter was settling into my soul. Time for a little baking … time for the colors of the bowls to permeate my spirit and set my senses free, lifting them to a higher plain. I choose yellow. I choose cinnamon rolls. I choose life in the kitchen. I choose to remember the happiness that came with the 1940’s Pyrex bowls. Somehow their comfort never ceases.